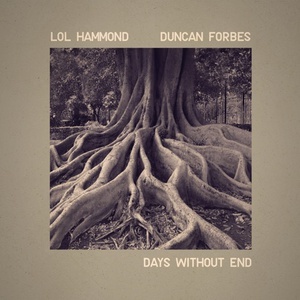 Lol Hammond and Duncan Forbes's roots lie firmly in the boundary-pushing dance music of the 1990s as founding members of the innovative and legendary acts Drum Club and Spooky respectively and went on to become firm friends, after sharing the bill at many of the same clubs and festivals together over the following halcyon years. Fast forward to the early noughties and during a weekend break at Duncan's house the two found themselves finally working together creatively in the studio and a fruitful new relationship was born. This resulted in the pair developing themselves as successful composers and music supervisors, scoring several films, including The Hatton Garden Job (2017), Accident Man (2018), 90 Minutes (2012), and the Tribeca award-winning Obey (2018). From these studio sessions the duo also embarked on recording their first full-length studio album together, resulting in Days Without End on their own newly created Sparkle Jar Records. Days Without End could be described as a soundtrack to a film that has not yet been made. Both Lol and Duncan have a deep love and fascination for film and through this album urge the listener to picture their own movie scenes as they listen. The album takes in sounds across ambient, neo classical, and blissful chilled-out beats guiding the listener on a journey into their own imaginary film soundtrack. For fans of: Nils Frahm, Ólafur Arnalds, Cocteau Twins, Brian Eno.